I came so close to reading all of the books on my spring TBR: seven out of ten! And yet... I'm being ambitious this summer and listing twelve books that I hope to read. I know that I should have no problem reading this many books, and I think that I've picked ones that I will actually read. I certainly hope that I do! 1 - 3. Shadow and Bone, Siege and Storm and Ruin and Rising by Leigh Bardugo - I know, I know. If you love this series, you're probably shocked that I still haven't even started it. I kept meaning to read it, and then I finally just decided to wait until the final book was out so I could binge the whole series. The time has finally come! 4. The One & Only by Emily Giffin - I've always enjoyed Giffin's books, even though I like some better than others. They are usually perfect summer reads, and this one seems to be no different. I pre-ordered this lovely, and I'm looking forward to seeing Giffin do something new. 5. Landline by Rainbow Rowell - Is this even a question? This is the one book I wish I'd managed to get at BEA, but I'm consoling myself with a reminder that it comes out soon. I don't have that much longer to wait! 6. I'll Give You the Sun by Jandy Nelson - I was so happy when I managed to grab this book at a BEA drop. The cover is gorgeous, and I know the writing inside will be even lovelier. I've been dying for more from Nelson ever since I read The Sky is Everywhere, and I have a feeling this will be totally worth the wait. 7. The Story of Land and Sea by Katy Simpson Smith - This cover is stunning in person, and I am really excited about this story. I'm always on the lookout for books set during the Revolutionary War because it's one of my favorite time periods. I've read some high praise for this debut, and I'm hoping it surpasses all my expectations! 8. Liar, Temptress, Soldier, Spy by Karen Abbott - One of my favorite books so far this year was about a woman who dressed as a man to follow her husband into war, so I was immediately drawn to this non-fiction account of four women who went undercover during the Civil War. It sounds amazing! 9. The Miniaturist by Jessie Burton - I can't even describe my excitement levels when I was able to get this book at BEA. It was one of their "Buzz" titles, but I'd already fallen in love with the cover and was so intrigued by the summary. I talked to a publicist who'd already read this debut, and she said so many wonderful things about it! 10. Heir of Fire by Sarah J. Maas - Are you even a little bit surprised? This is at the VERY TOP of my TBR. I made myself read a few upcoming review books first, but I can finally dive back into this world. I have no idea what Maas is going to do to these characters, but I know my feelings will go through the ringer! 11. The Queen of the Tearling by Erika Johansen - Reactions to this book have been mixed, but I'm hoping it will be a hit with me. I realized recently that I've been really drawn to fantasy titles, which is a nice change. I was definitely intrigued by the summary! 12. Mortal Heart by Robin LaFevers - I re-read Grave Mercy on the plane ride to BEA, and then I read Dark Triumph on the flight home. So, it's now time to fall in love with Annith and her story! I've already heard great things from people who've read this book, and I can't wait to see for myself. Sooo many of these are highlights on my summer/fall to read list too. 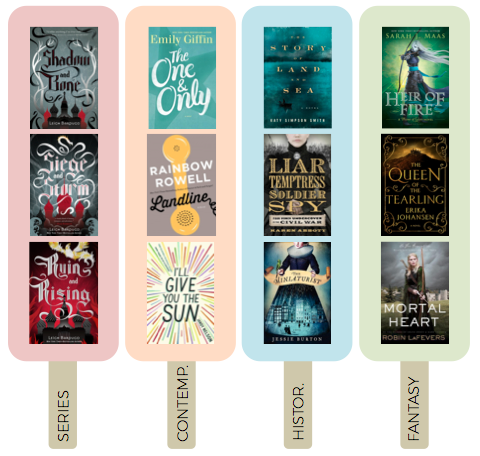 I am a huge fan of both Sarah J. Maas and Robin LaFevers, so of course Heir of Fire and Mortal Heart are definitely on my list. Thanks to your BEA book haul I'm also really interested in The Miniaturist by Jessie Burton and Liar, Temptress, Soldier, Spy by Karen Abbott. I haven't read the Shadow and Bone series either but I've heard so many great things (and honestly, it does seem right up my alley) - so I don't know why I haven't picked it up yet, but I'm definitely going to soon! The cuteness of those popsicles kills me! I love how you split up your list -- so many great choices. I had a hard time limiting my list because I want to read ALL THE BOOKS, but what else is new?! Super excited about Liar, Temptrest, Soldier, Spy!!! Oooooo Mortal Heart. I need to get back to that series. I've never heard of that series but I've just had a look on Good Reads and it sounds quite good, so I'd definitely like to read these sometime soon! I also reaaaaally want to read Landline! You've got some great picks on here! I'm really excited for Landline! I liked Eleanor and Park, but I really want to read Attachments too. Her adult fiction just seem so approachable to me. I just read Shadow and Bone last month, so I'm pretty much just jumping on the Grisha bandwagon myself! I'm really looking forward to reading Siege and Storm and Ruin and Rising back to back! 1. Grisha Trilogy - YES. Yes yes yes. I think this trilogy is excellent, with a unique world, great characters and a story that *I* too am dying to find out the end of! Need Ruin & Rising, stat. 2. Emily Giffin! I'm looking forward to this one since it's been a while since I've read a book by her. I've enjoyed her novels in the past, and don't think this should be any different. 4. The Miniaturist - I'm really, really looking forward to this one! The cover is phenomenal, but the story sounds even more intriguing. Cannot wait! 5. ALL OF THE LOVE FOR HEIR OF FIRE. 6. I'm also looking forward to reading Queen of the Tearling! It sounds like the type of novel I could potentially love, so I really hope that turns out to be the case. 7. ALL OF THE LOVE FOR MORTAL HEART. I've seen a lot about Grave Mercy and I guess that's part of a series? Need to get on board and read it apparently! I love how you set this up! It's so cute. Read the Giffin book soon please! !